It’s back! Phoenicians rejoice! Fall Arizona Restaurant Week is almost here! Returning for its 9th season, Fall Arizona Restaurant Week will run for ten nights from September 16th-25th. As always, restaurants and chefs are preparing pre-fixe menus with 3 courses for $33 or $44. We had the opportunity to preview a few of the items being offered and if last night’s meal is any indication, diners are in for a real treat! Roasted Acorn Squash Soup (with house made cinnamon marshmallows and candied pecans)– This perfect for fall soup was velvety smooth and shockingly savory. You might expect a squash soup with marshmallows and candied pecans to be sweet but that simply wasn’t the case. This soup was one of our favorite items of the evening and we really hope to see this stay on the menu after Arizona Restaurant Week. Buffalo Mozzarella (with baby wild arugula, heirloom tomatoes, shaved red onions, grilled levain bread, balsamic reduction, and basil vinaigrette)– For the cheese lover, this is a fantastic starter. Light and fresh, it is the best choice for a light eater as it is definitely not heavy. That being said it is jam packed full of flavor! Seared Trumpet Royal Mushroom (with butternut squash risotto and crisp brussels sprouts)– Probably the most unique of the starters we tried was the Seared Trumpet Royal Mushroom. The mushroom was earthy and when paired with the slightly sweeter risotto, the umami notes really popped. Seared Wagyu Beef (with truffle and yuzu mignoette, shaved parmesan, and radish salad)– Seared to perfection, the wagyu beef is the starter perfect for the meat lover in your life. The acidity of the mignoette topped radish salad and the saltiness of the parmesan compliment the beef spectacularly. Pan Roasted Branzino (with shishito peppers, tomato jam, fingerling potatoes, and kalamata olive aioli)– The branzino at T. Cook’s was our second favorite item of the evening. The fish was cooked beautifully and the skin was crispy. Any time you can get perfectly cripsy skin on fish, you’ve won us over. Wild Arugula & Truffle Tremor Ravioli (with black Tuscan kale, celery root, eggplant, and romesco sauce)– Kale and goat cheese in the same course? How could this ever be bad? A fantastic choice for the vegetarian diner, the raviolis were full of truffle flavor, but not overly so. The bite of the kale toned down the richness, creating a well balanced dish. Braised Natural Short Rib (with baby fennel, cipollini onion, ricotta gnocchi, and aged balsamic)– The Braised Short Rib is the meat and potatoes type entree without being so. Comforting and savory, yet still elevated. The fennel really brings this dish to the next level. 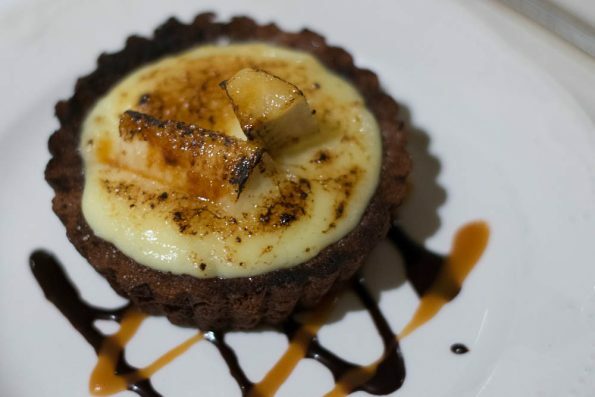 Banana Brulee (with coconut pastry cream, sliced banana, delicate chocolate crust, bruleed to order)– Talk about ending the evening with a bang! The Banana Brulee was so decadent. The pastry cream was not only flavored with coconut but also had pieces of shaved coconut in it. The crust was crumbly once you started to dig in but in a good way. The contrast of creaminess of the pastry cream and the crunchiness of the crust was magical. Let’s also not forget how amazing bruleed banana is. Full of natural sugar, the second you cook it, it turns into nature’s candy. 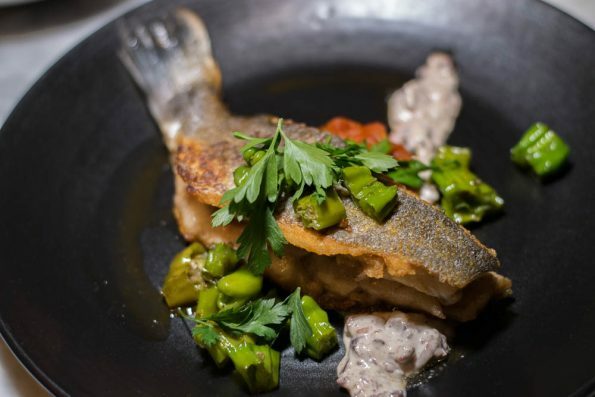 As we mentioned at the start, Fall Arizona Restaurant Week is sure to please! 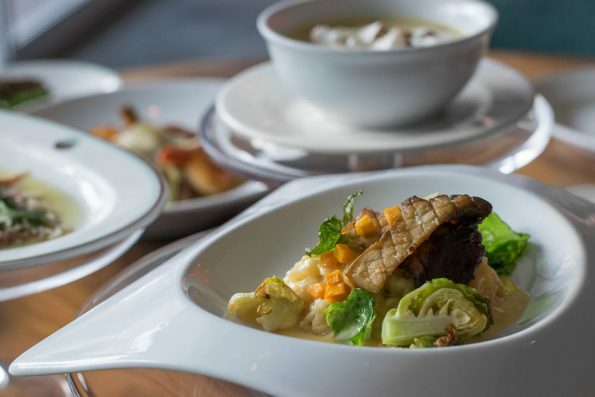 From what we have tasted and seen on menus, you are definitely not going to want to miss this season! Which restaurant will you be trying for Arizona Restaurant Week? Share your favorites below and tag your photos with #GeekEats and #EatARW. We can’t wait to see what you’ve tried! *The Geeks participated in a media dinner to facilitate this write-up; Information about the menu items was provided to us, opinions are wholly our own. View our Disclosure Policy for more info.